With this FREE eCookbook, baking becomes easy and efficient! Skip all the extra work and still get the same delicious results; try one of these amazing recipes using cake mix and you'll understand what we're talking about! We all have those times when we crave something sweet but don't have the time to make an elaborate dessert recipe. That's where these simple 30 minute recipes for dessert come in. With these 8 Fast Dessert Recipes, you can whip up a sweet snack in a snap. No waiting by the oven for what seems like hours on end; these delicious desserts will be ready in half an hour or less! 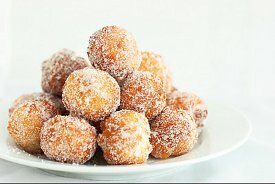 15 Minute Donuts from Scratch (shown above) - Who knew you could make homemade doughnuts in just a quarter of an hour? It seems incredible, and it is! When you need a fast doughnut fix, turn to this lightning fast dessert recipe! 20 Minute Fruit Cobbler - Cobblers usually take a bit of time to make, but this fast dessert recipe uses a few shortcuts to help speed up the process. Bisquick and a can of fruit pie filling make for one of the quickest 30 minute recipes you'll ever prepare. 6 Minute Miracle Cookies - Some may call it miraculous, but we just call it delicious! This quick cookie recipe is just about as fast as they come, and it's also one of our most tasty dessert treats. Give this awesomely fast cookie recipe a try and see what you think! The Fastest Fudge in the World - With a name as impressive as this, this quick fudge recipe has a lot to live up to. Luckily this really is one of the fastest desserts to prepare. Just four simple ingredients and three quick steps are all it takes to prepare this decadent fudge treat. 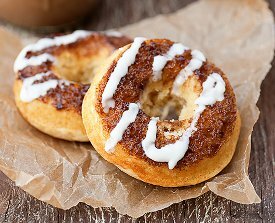 Cinnamon Roll Donuts (shown above, left) - A combination of two of the best dessert recipes of all time, this recipe for Cinnamon Roll Donuts is pretty hard to beat. When you add in the fact that these delectable doughnuts can be made in just 20 short minutes, you know you have a winning dessert dish on your hands. The Best Peanut Butter Bites (shown above, right) - If you're a peanut butter fan, you won't be able to resist these incredible peanut butter cookies! A fast and easy cookie recipe, this is one of those desserts you'll find yourself making again and again because it's so easy... and so delicious! 30 Minute Chocolate Cake - Prepare to be impressed because this awesome recipe for chocolate cake can be completed in a half an hour or less! Just mix all of the ingredients together in one saucepan and then pop the cake in the oven for a quick 20 minutes. That's all it takes to make this chocolaty treat, one of our favorite fast dessert recipes of all time. 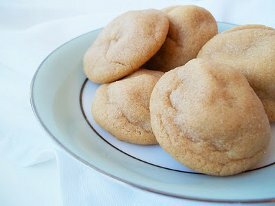 Pete's 10 Minute Peanut Butter Cookies - Since dessert fans know you can never really have enough recipes with peanut butter, we decided to throw another yummy peanut butter cookie recipe into this collection of sweet 30 minute recipes. These tasty cookies bake in just 10 short minutes, meaning you'll be enjoying these treats before you know it! We hope you enjoyed this collection of fast dessert recipes. We know how hard it can be to wait to get your sugar fix, especially when that sweet tooth strikes. That's why 30 minute recipes for dessert exist, and we're so glad they do! Find even more fast meal ideas in this collection of great 30 Minute Recipes. Find 21 quick and easy meals in this free, downloadable recipe collection. Get yours today!